A particular culture is associated with a particular community, and thus has a social dimension. But how does culture operate and how is it to be defined? Is it to be taken as the behavioral repertoire of members of that community, as the products of their behavior, or as the shared mental content that produces the behavior? Is it to be viewed as a coherent whole or only a collection of disparate parts? Culture is shared, but how totally? How is culture learned and maintained over time, and how does it change? 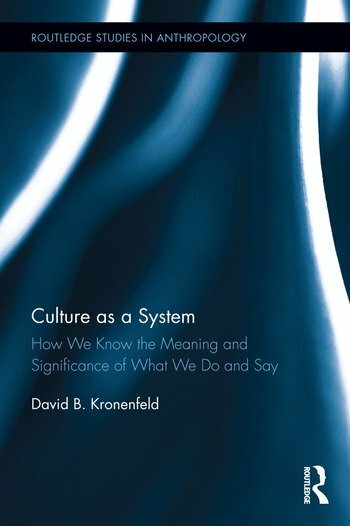 In Meaning and Significance in Human Engagement, Kronenfeld adopts a cognitive approach to culture to offer answers to these questions. Combining insights from cognitive psychology and linguistic anthropology with research on collective knowledge systems, he offers an understanding of culture as a phenomenon produced and shaped by a combination of conditions, constraints and logic. Engagingly written, it is essential reading for scholars and graduate students of cognitive anthropology, linguistic anthropology, sociology of culture, philosophy, and computational cognitive science. David B. Kronenfeld is Emeritus Professor in the Department of Anthropology at University of California, Riverside, USA.